There was a howling wind and the rain was making it hard to see the road ahead. Storm Barbara had swept in from the Atlantic and we felt like the car was about to be washed away. It was, though, a perfect way to arrive at our destination. A warm welcome took on an extra meaning following a quick dash from the car park to the protection of the grand portal of Stobo Castle. For 24 hours at least this ‘destination spa’ also became a refuge from the worst weather of the winter. 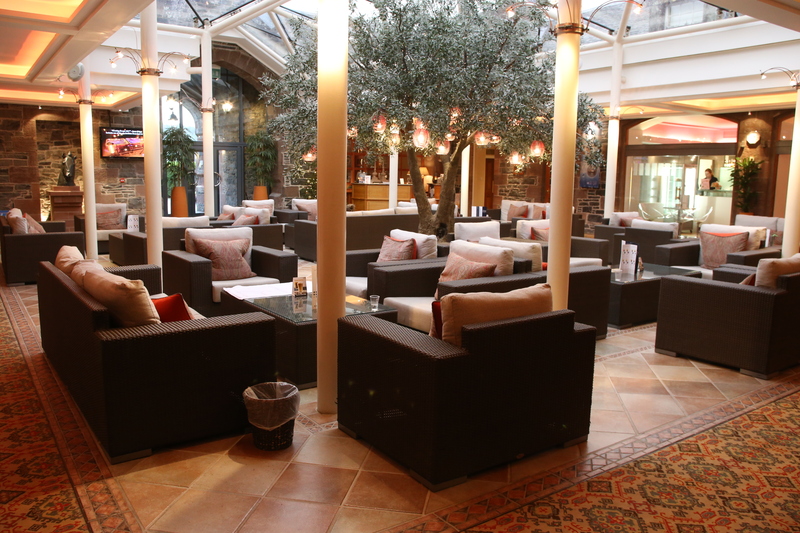 Stobo is where you go to unwind, for a bit of pampering, some fine food and to switch off. After a perilous journey it also provided some relief, and its richly decorated interiors became an even cosier home from home. Let the wind and rain do their worst: in here we could kick off our shoes, walk around in our complimentary bathrobes, and…well, just chill. 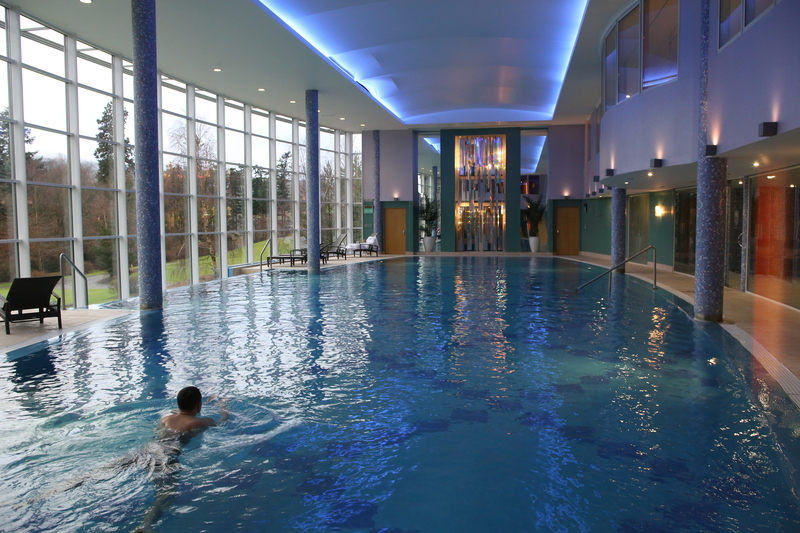 The Castle, a short drive from Peebles in the Borders, is a haven of tranquility which has benefited hugely from its spa extension, making it a popular getaway for weekenders. Guests can be as energetic, or as sluggish as they desire. There’s a gym for those wishing to sweat out the week’s stresses, or the drawing room to relax over tea and selection of newspapers. Everyone is asked not to use their mobile phones in certain areas. We stayed during the Christmas break, taking advantage of a special offer which included dinner, breakfast and lunch, together with use of the pool and other facilities. Spa treatments were additional. The room was well equipped with gowns, hair dryer, ironing board and electric fan, some of which are not always provided even in five-star hotels. However, a small sofa would have been more comfortable than the two small chairs provided. Dinner was formal, and – quite rightly – there is a dress code. No football shirts, shorts or trainers on view. The dishes were of a standard expected, the duck in particular, though my favourite was the rice pudding served at lunchtime. As a bit of a fan I was testing it against the delicious rice pudding served at Gleneagles and I have to say it was just as good! Had the weather been better there would have been an opportunity to enjoy the outdoor activities including walks around the estate, the Japanese Water Gardens, tennis courts and mountain bike trails. Visitors are advised to take good walking boots and appropriate clothing. The big attraction, of course, is the spa with its extensive range of treatments for parts of the body you probably don’t even know about. From full body paraffin waxes and mud wraps to Indian head massages and instant glow green tea facials, there is not much they don’t provide. My guest enjoyed an express facial while I opted for a dip in the pool with its panoramic glass wall providing relaxing views over the still, quiet Borders countryside. It’s what this place is really all about. Terry Murden and guest paid for one night with dinner, breakfast and lunch included: £328. A bottle of Rioja Tempranillo Sonsierra cost £25.95. An express facial (25 mins) was £35.